Trying to catch back up after the holidays has been a bit rough for me. Hence the missing posts on Monday and Tuesday. Being home, relaxing, spending time with family has definitely taken priority, so I’m not complaining too much. Not that every holiday isn’t usually focused around the outfit, but I feel like with New Years Eve it is all about the outfit. 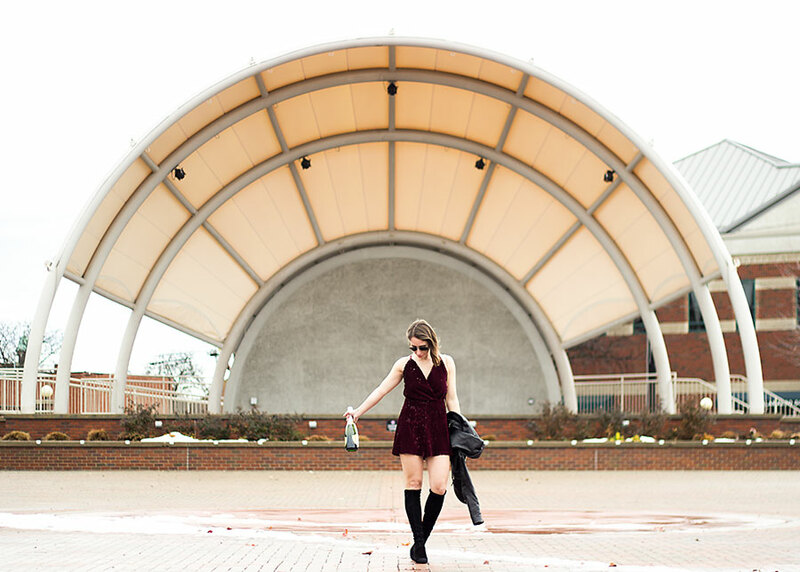 Sequins aren’t normally my thing, but I feel like they are pretty necessary for a great NYE outfit. This velvet and sequin romper definitely caught my eye for the color (because burgundy is my new obsession) then I saw the back and we all know I am a sucker for an open back. TBH Brand and I will probably keep it pretty low key on New Years Eve, but I’ll definitely have this romper on hand just in case. That romper is so pretty! Also so perfect for new year's! Girl I have never seen anything like that – I love love sooooo much!!! This romper is beyond perfect!! I wish I could squeeze into this on NYE! And that jacket…for real the best jacket ever, right?! loving the romper idea for NYE! Cant believe its in a few days! This romper is a show stopper! LOVE it. Loved this romper paired with the leather jacket and boots! Perfect way to make your entire look more edgy and fun! Okay I need this in my life like now!! This is sooo pretty!! I love it on you – I need to grab something still for NYE! The back of the romper is so gorgeous! I love all of the sequins, and the back detailing! Hottie alert! This romper is NYE goals. So fun and perfect to welcome 2017! Oh I love this!! Of all the NYE outfit posts I've seen so far this is my favorite. I absolutely love the color! Oh I'm with you….I've had the hardest time coming back from Christmas weekend too. Perhaps I was still in a food coma this week, haha!! Love this look by the way! You look great!! beautiful,Shannon! Fabulous photos, my friend. Love that color! And I have that coat and looove it! AHHH this romper is to die for!! OBSESSED!!! That romper is so perfect! The velvet and color is gorgeous! So perfect for NYE! This romper is to die for! The back is darling but even the front silhouette is perfect. It looks amazing on you; I hope you find somewhere to wear it on NYE!